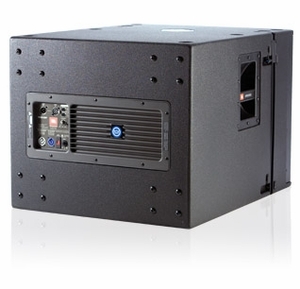 Built-in JBL Drivepack� DPC-2 amplifier module designed by Crown provides 1500 Watts of peak Power. DSP based resident input module provides system optimization, EQ and crossover functionality. 18 inch, 2268FF dual voice coil, neodymium magnet Differential Drive� woofer for high-power capacity and light weight. User Controls : Input Attenuator (0-16 dB) Selectable 80 Hz or 120 Hz Low Pass 80 Hz High-Pass enable/disable for XLR loop thru. Enclosure : 18 mm birch plywood.